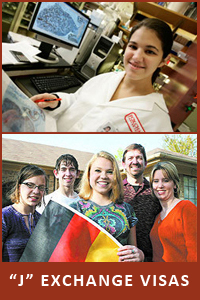 The J exchange visitor visa has an emphasis on cross-cultural exchange. The visa is available if the foreign national is coming to the United States as a professor or research scholar, short-term scholar, trainee or intern, college or university student, secondary school student, or summer student in work/travel program. Other J-1 categories include professor or research scholar, teacher, nonacademic specialist, foreign physician, international visitor, government visitor, camp counselor, or au pair. The requirements for this American J1 Visa include DS-2019 certificate of eligibility issued by the Department of State. The requirements depend on the category. The national must demonstrate that he or she has the sufficient funds. Another requirement is that the national must be fluent in English. The foreign national must demonstrate that he or she has sufficient medical insurance and that he has a residence abroad. If you, your family, your school, or your organization needs professional assistance in filing for a Special J Visa contact a Los Angeles County Immigration Attorney at the Law Offices of Vincent W. Davis & Associates.